In my last posts I had shown the method of transforming the Medieval labyrinth by leaving out the barriers. The first possibility to generate a labyrinth is of course the use of the seed pattern. Thus most of the Scandinavian Troy Towns with 7, 11, or 15 circuits were created. Some years ago I wrote about the meander technique. Thereby many new, up to now unknown labyrinths have already originated. Andreas still has demonstrated another possibility in his posts to the dual and complementary labyrinths. New versions of already known types therein can be generated by rotating and mirroring. Now I want to use this technology to introduce some new variations. I refer to simple, alternating transit mazes (labyrinths). Tony Phillips as a Mathematician uses this designation to explore the labyrinth. He also states the number of the theoretically possible variations of 11 circuit interesting labyrinths: 1014 examples. The theoretically possible interesting variations of the 3 up to 7 circuit labyrinths once already appeared in this blog. I construct the examples shown here in the concentric style. One can relatively simply effect this on the basis of the path sequence (= circuit sequence or level sequence). There is no pattern necessary. The path sequence is also the distinguishing mark of the different variations. To create the dual version of it, I number the different circuits from the inside to the outside, then I walk from the inside to the outside and write down the number of the circuits in the order in which I walk one after the other. This is the new path sequence. The result is: 5-2-3-4-1-6-11-8-9-10-7- (12). In this case it is identical to the original, so there no new labyrinth arises. Therefore, this labyrinth is self-dual. This in turn testifies to a special quality of this type. Now I generate the complementary version. 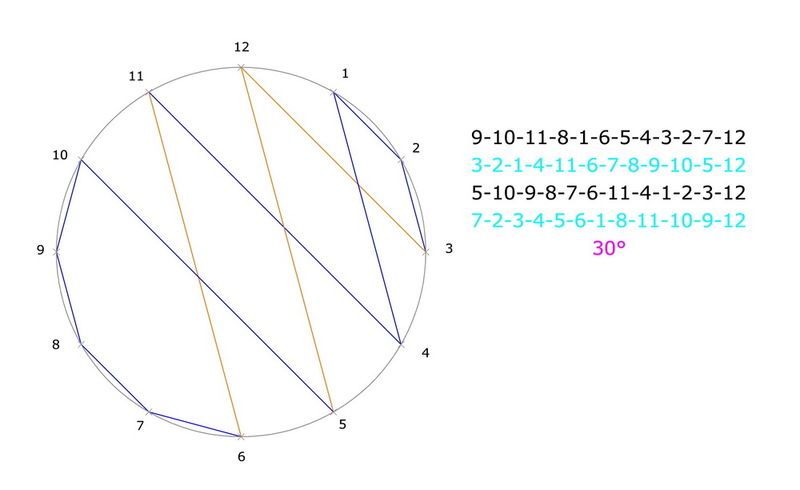 For that to happen I complement the single digits of the path sequence to the digit of the centre, here “12”. If I add the single values of the row on top to the values of the row below, I will get “12” for every addition. Or, I read the path sequence in reverse order. This amounts to the same new path sequence. But this is only possible with self-dual labyrinths. I now draw a labyrinth to this path sequence 7-10-9-8-11-6-1-4-3-2-5-12. This new labyrinth is hardly known up to now. Now I take another labyrinth already shown in the blog which was generated with meander technique, however, a not self-dual one. 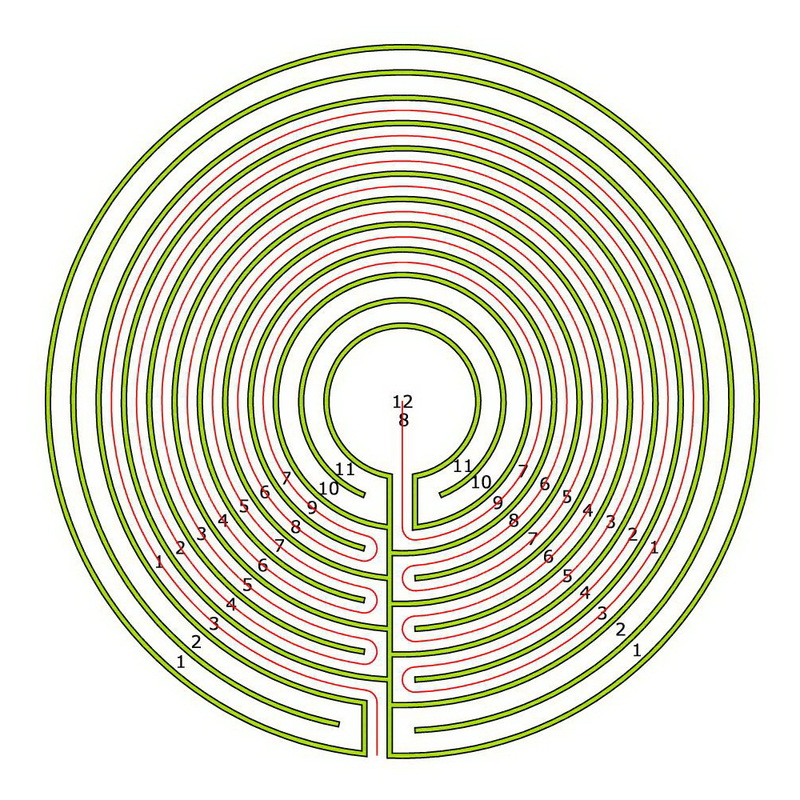 First, I determine the path sequence for the dual labyrinth by going inside out. And will get: 7-2-5-4-3-6-1-8-11-10-9- (12). Then I construct the dual labyrinth after this path sequence. Now I can generate the complementary specimens for each of the two aforementioned labyrinths. Upper row the original. Bottom row the complementary one. The bottom row is created by adding the upper row to “12”. Now the path sequence of the dual in the upper row. The complementary in the lower one. Again calculated by addition to “12”. I have gained three new labyrinths to the already known one. For a self-dual labyrinth I will only receive one new. Now I can continue playing the game. For the newly created complementary labyrinths I could generate dual labyrinths by numbering from the inside to the outside. The dual of the complementary to the original results in the complementary of the dual labyrinth. And the dual of the complementary to the dual one results in the complementary one of the original. The path sequences written side by side makes it clear. In the upper row the original is on the left, the dual on the right. In the row below are the complementary path sequences. On the left the complementary to the original. And on the right the complementary to the dual one. The upper and lower individual digits added together, gives “12”. It can also be seen that the sequences of paths read crosswise are backwards to each other. I can also use these properties if I want to create new labyrinths. By interpreting the path sequences of the original and the dual backwards, I create for the original the complementary of the dual, and for the dual the complementary of the original. And vice versa. If I have a single path sequence, I can calculate the remaining three others purely mathematically. Sounds confusing, it is too, because we are talking about labyrinths. For a better understanding you should try it yourself or study carefully the post from Andreas on this topic (Sequences … see below). Quite simply: By leaving out the barriers in the minor axes. 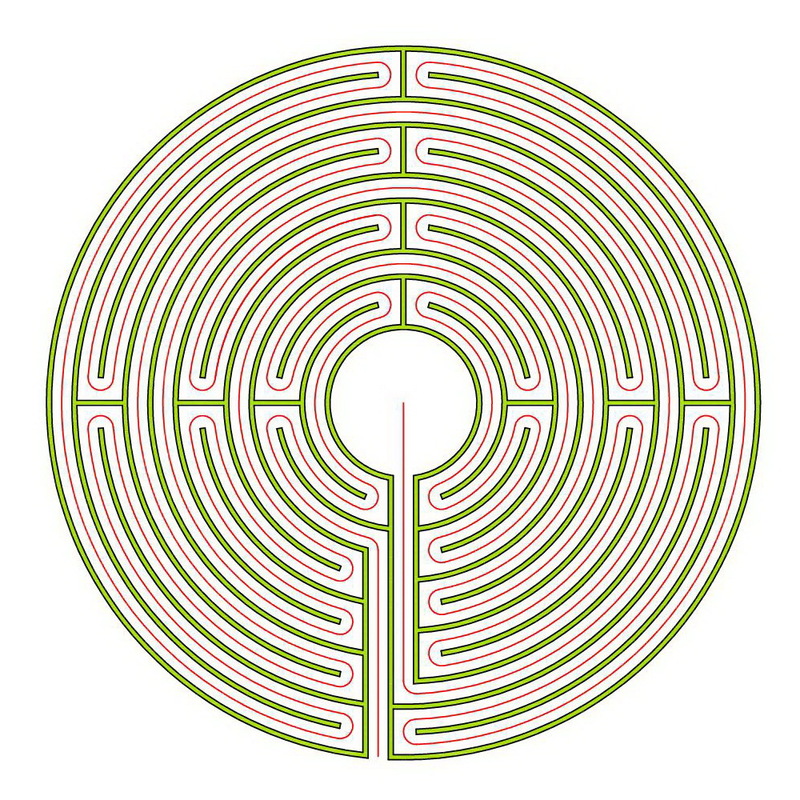 I have already tried this with the Chartres labyrinth some years ago. And in the last both posts on this subject with the types Auxerre and Reims. You can read about that in the related posts below. Today I repeat this for the Chartres labyrinth. Here the original in essential form, in a concentric style. 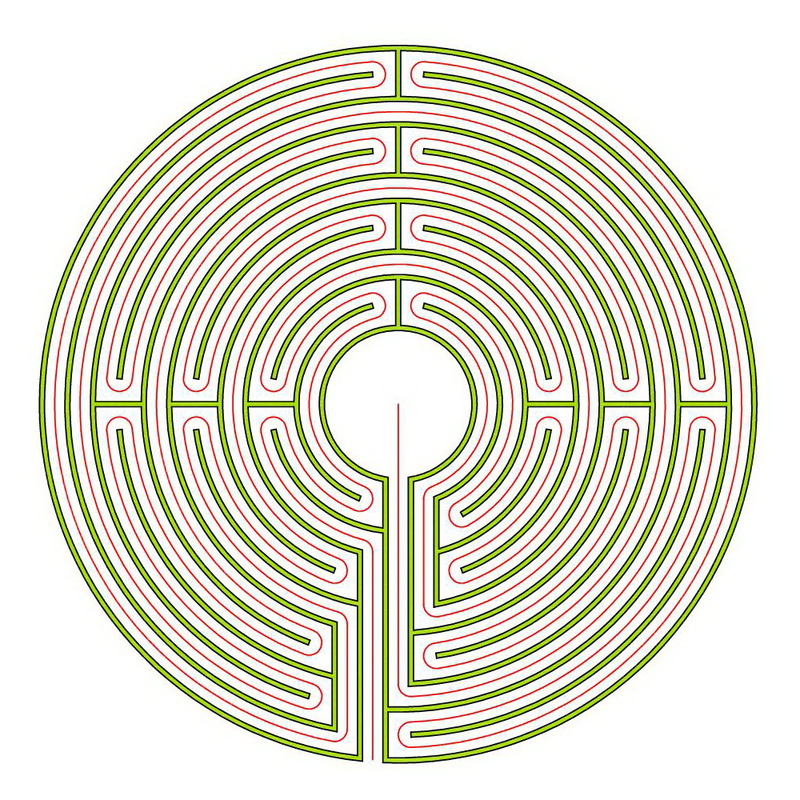 The original with all lines and the path in the labyrinth, Ariadne’s thread. The lunations and the six petals in the middle belong to the style Chartres and are left out here. Now without the barriers in the minor axes. 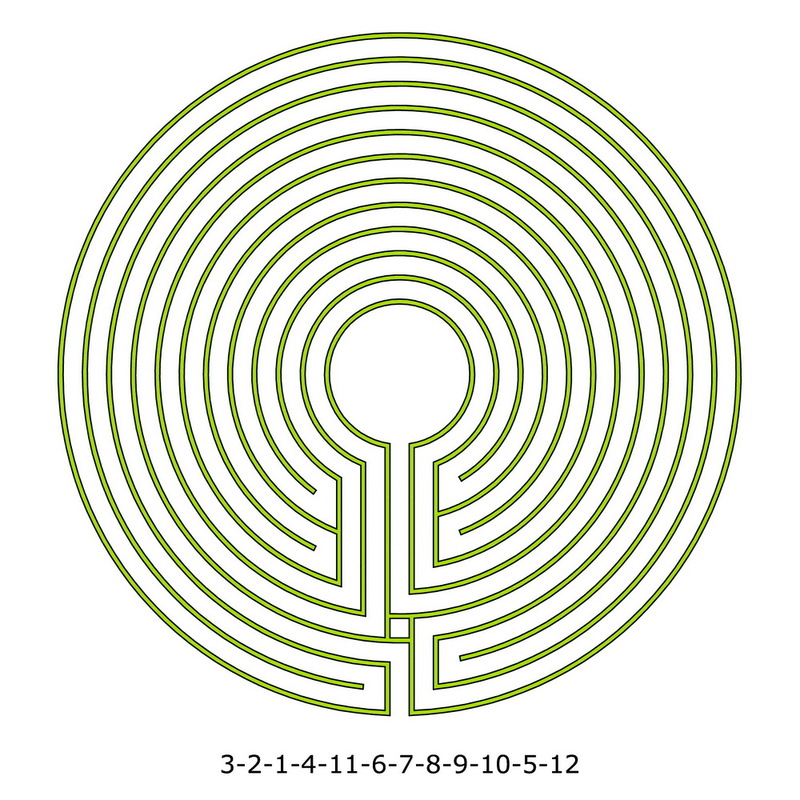 All circuits can be included in the labyrinth originating now, differently from the types Auxerre and Reims. The path sequence is: 5-4-3-2-1-6-11-10-9-8-7-12. We have eight turning points with stacked circuits. It is self-dual. That means that the way out has the same rhythm as the way in. 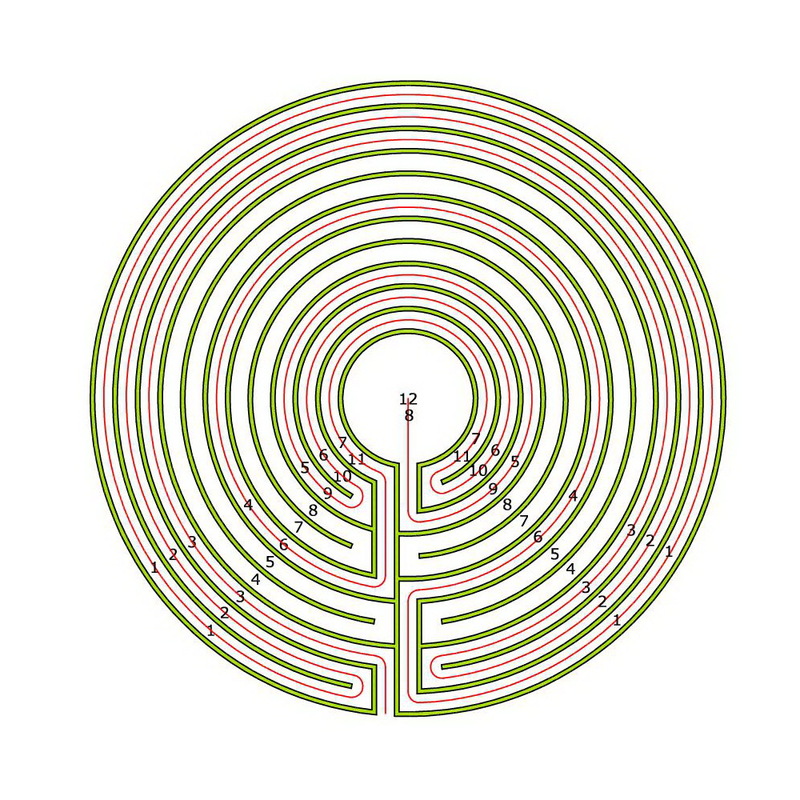 But this 11 circuit labyrinth is quite different from the more known 11 circuit labyrinth, that can be generated from the enlarged seed pattern. The path sequence here is: 5-2-3-4-1-6-11-8-9-10-7-12. We have got four turning points with embedded circuits. 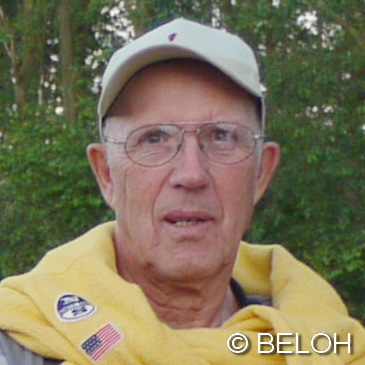 It is developed from quite another construction principle than the Chartres labyrinth. However, it is self-dual. Now we turn to the complementary labyrinth. The entry into the labyrinth happens on the 7th circuit, the center is reached from the 5th circuit. The barriers are differently arranged in the right and left axes, the upper ones remain. It is self-dual. The transformation again works, as it does for the original. The path sequence is: 7-8-9-10-11-6-1-2-3-4-5-12. Also this labyrinth is self-dual. We confront it with the complementary labyrinth, generated from the seed pattern. The path sequence on this is: 7-10-9-8-11-6-1-4-3-2-5-12. Contrarily to the original this type did not show up historically. 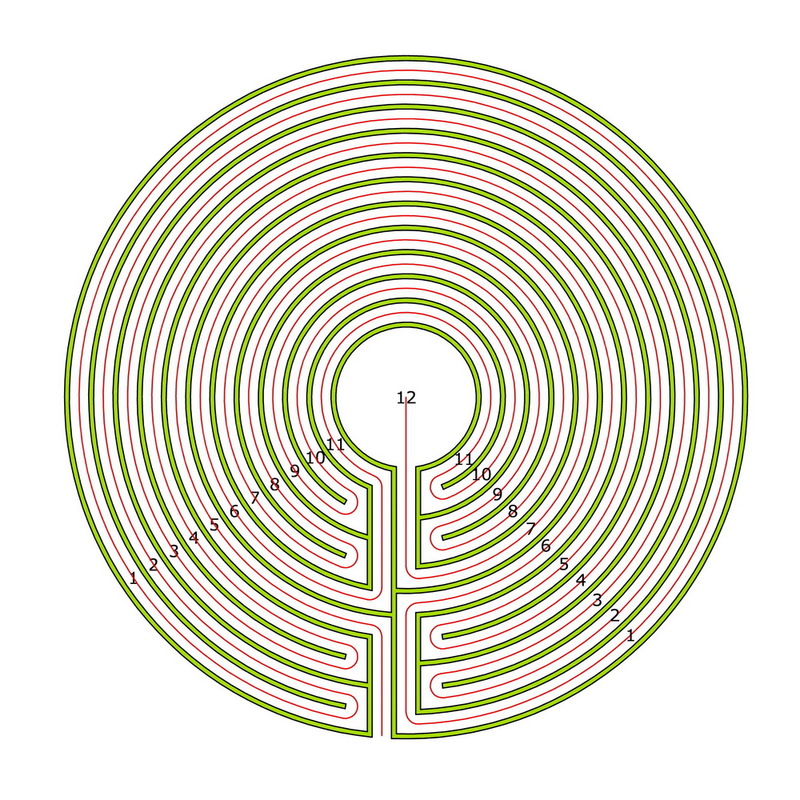 So we have created two completely new 11 circuit labyrinths from the Chartres labyrinth, which look different than the 11 circuit labyrinths that can be developed from the seed pattern. Does the Chartres Labyrinth hide a Troy Town, and if so, what does it look like? Quite simply: By leaving out the barriers in the minor axes. 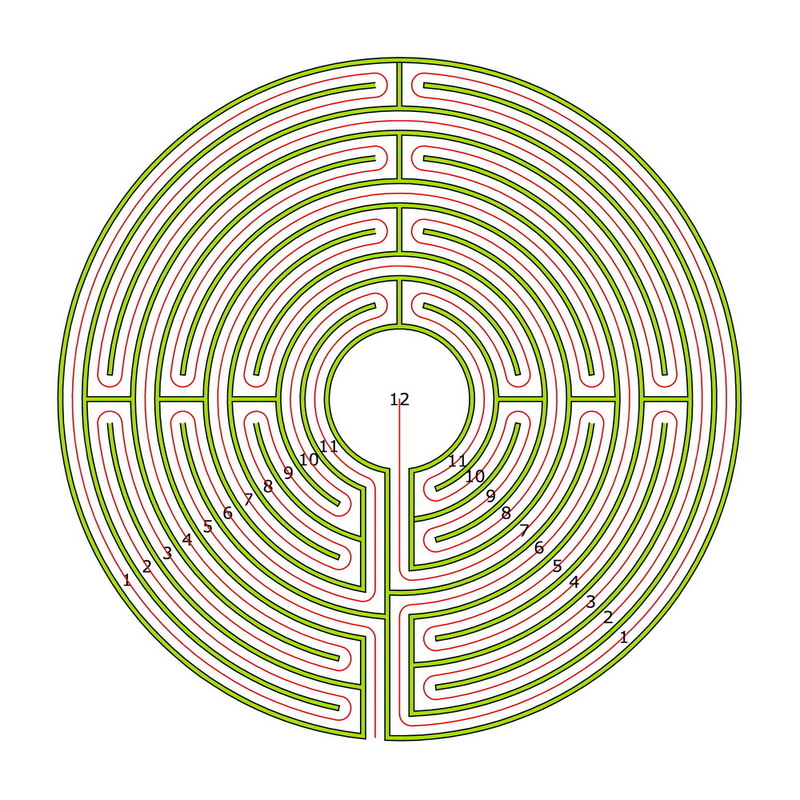 I have already tried this with the Chartres labyrinth (see related posts below). But is that also possible with any other Medieval labyrinth? In part 1 I had made it for the type Auxerre. Now I take the type Reims which is also self-dual like Chartres and Auxerre. And again I take the complementary version. All examples are presented in the concentric style. 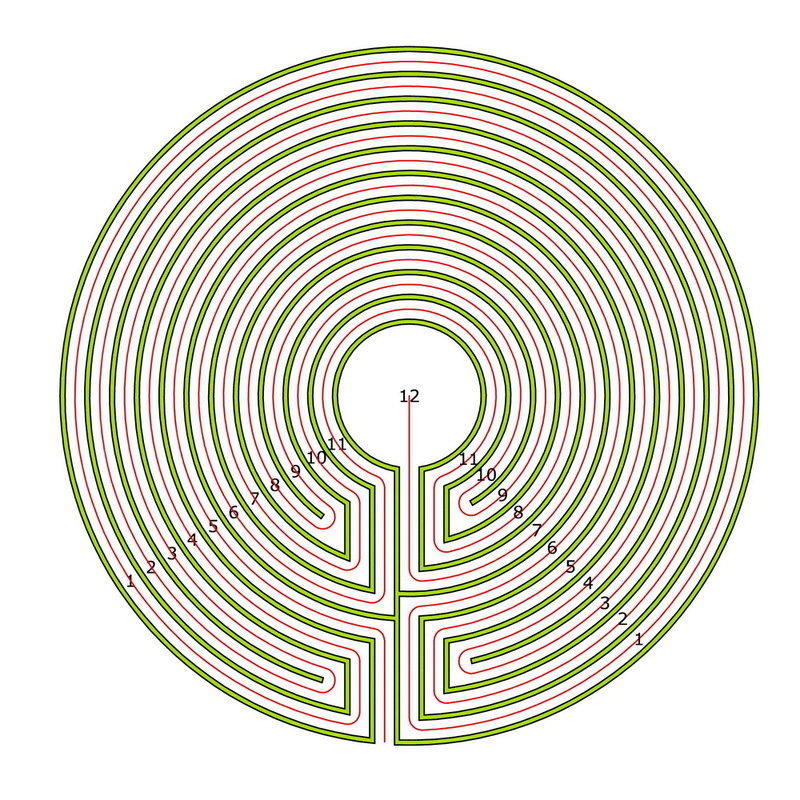 Here the original with all lines and the path in the labyrinth, Ariadne’s thread. The barriers in the upper minor axis are identical with those in the type Chartres, the barriers in the horizontal axis are different from Chartres, as well as the arrangement of the turning points in the main axis below the center. The barriers are left out. When drawing the path I had to discover that four lanes cannot be included. 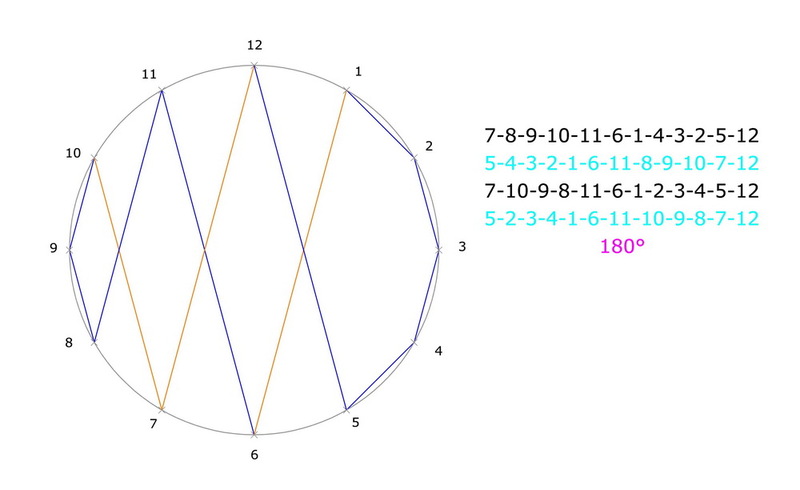 These are the both outermost and the both innermost tracks (1, 2, 10, 11). Hence, I have anew numbered the circuits and there remain only 7 circuits instead of the original 11. 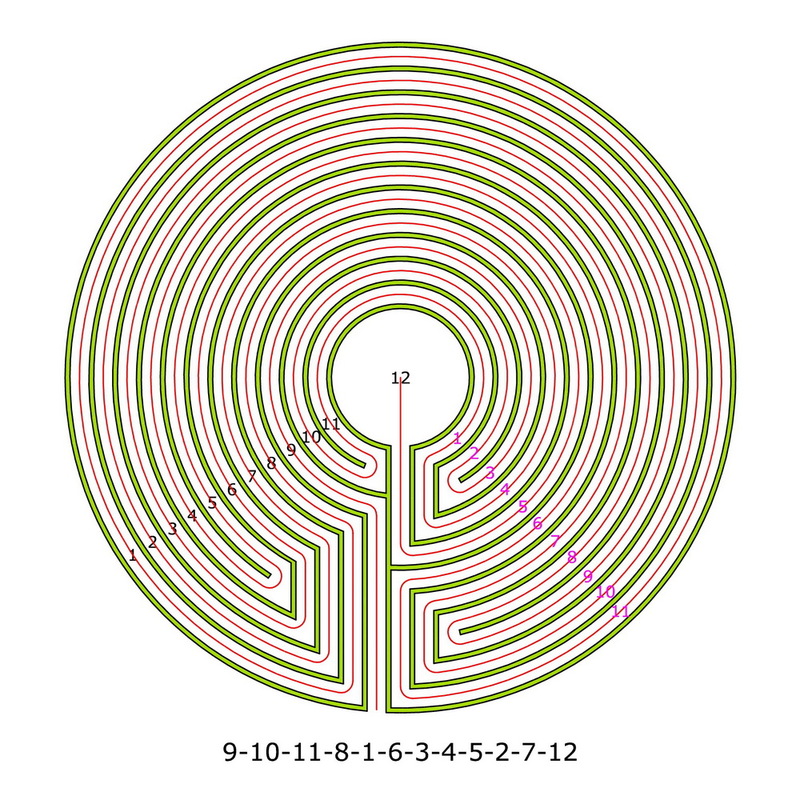 However, this also means that by changing the Reims Medieval labyrinth into a concentric Classical labyrinth through this method not an 11 circuit labyrinth is generated, but a 7 circuit. This is an up to now hardly known and not so interesting labyrinth. Since one enters the labyrinth on the first circuit and arrives at the center from the last. The path sequence is very simple: 1-2-3-4-5-6-7-8, a simple serpentine pattern. 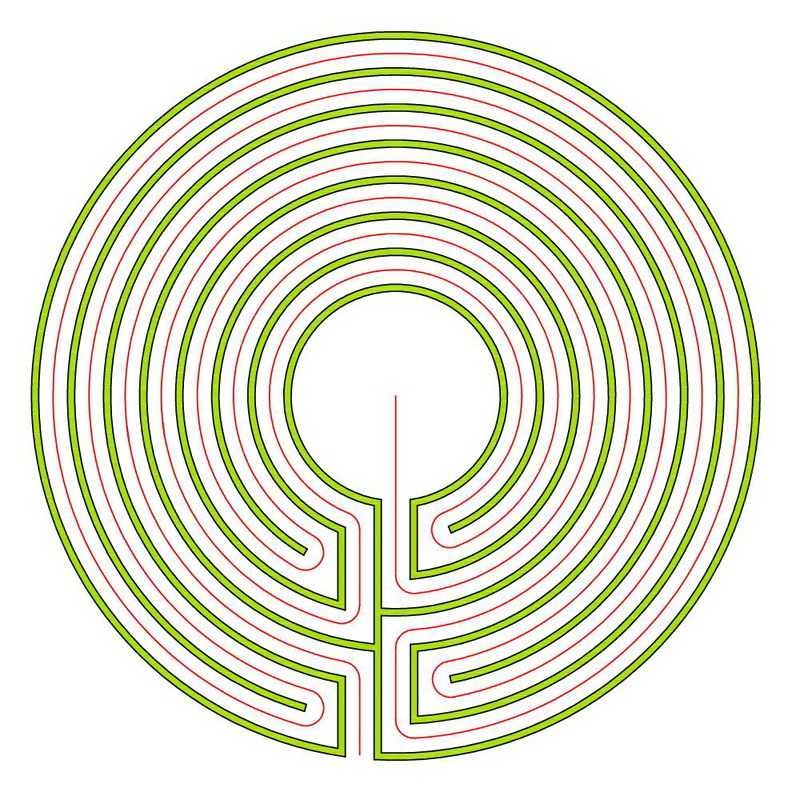 The complementary labyrinth is generated by mirroring the original one. The upper barriers remain, right and left they run differently and in the main axis, the turning points shift. 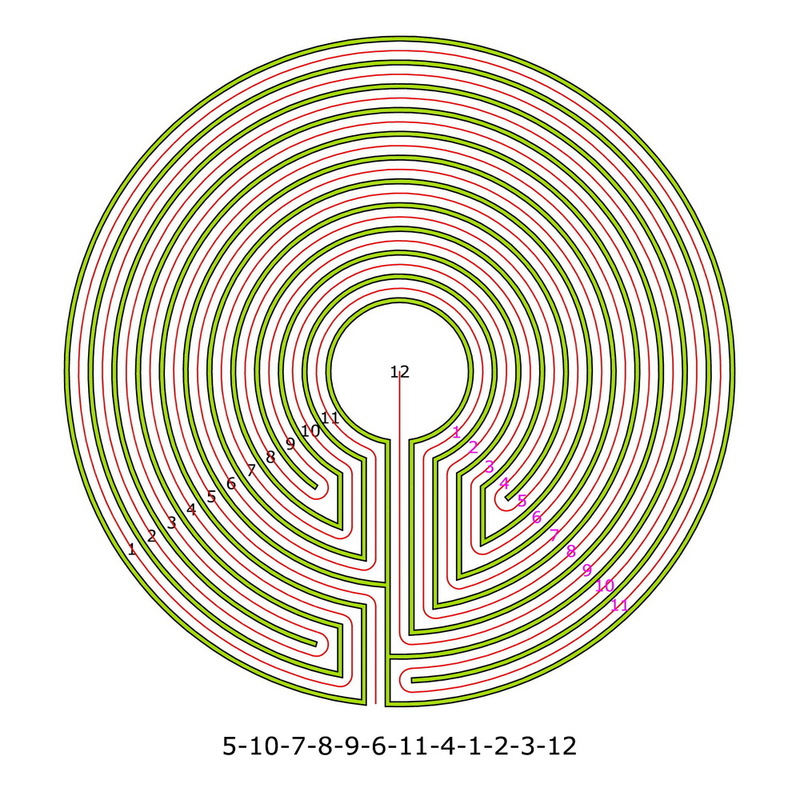 The entrance into the labyrinth changes to the middle (lane 9) and the entrance into the center is from further out (lane 3). As with the original four lanes can not be inserted (1, 2, 10, 11). 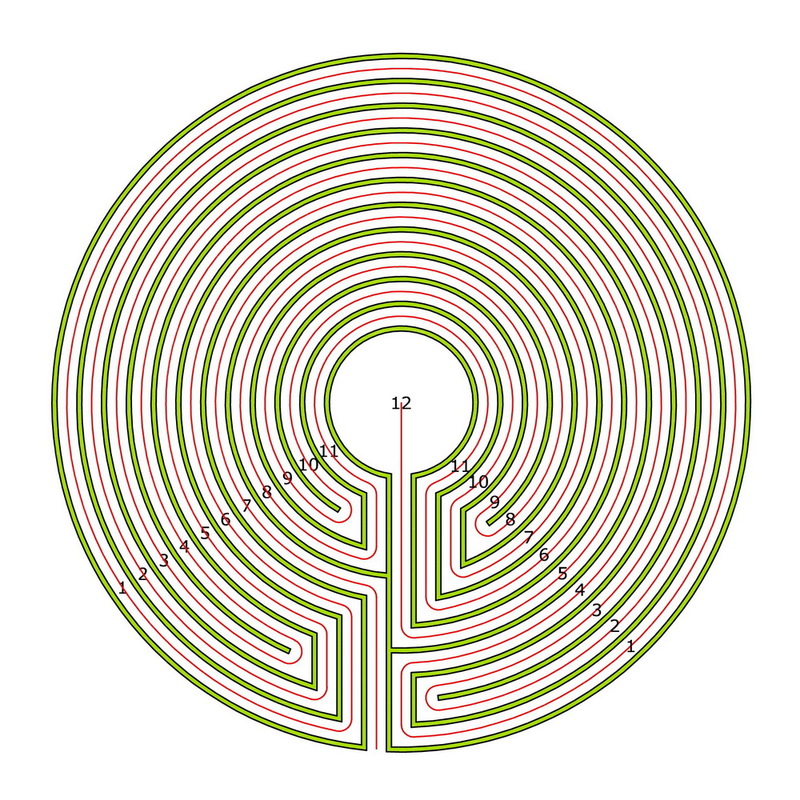 Hence, a 7 circuit labyrinth arises again. I have anew renumbered the lanes and have drawn the labyrinth anew. 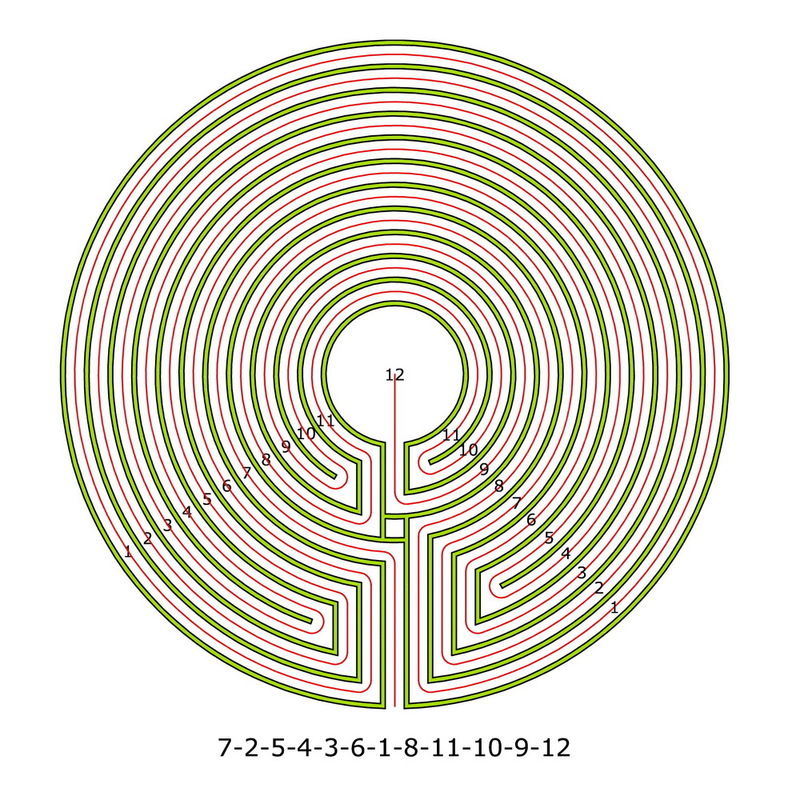 The labyrinth is entered on the 7th lane, the center is reached from the first lane. The path sequence is: 7-6-5-4-3-2-1-8. This labyrinth does not belong to the historically known labyrinths. However, it has already appeared in this blog (see related posts below). 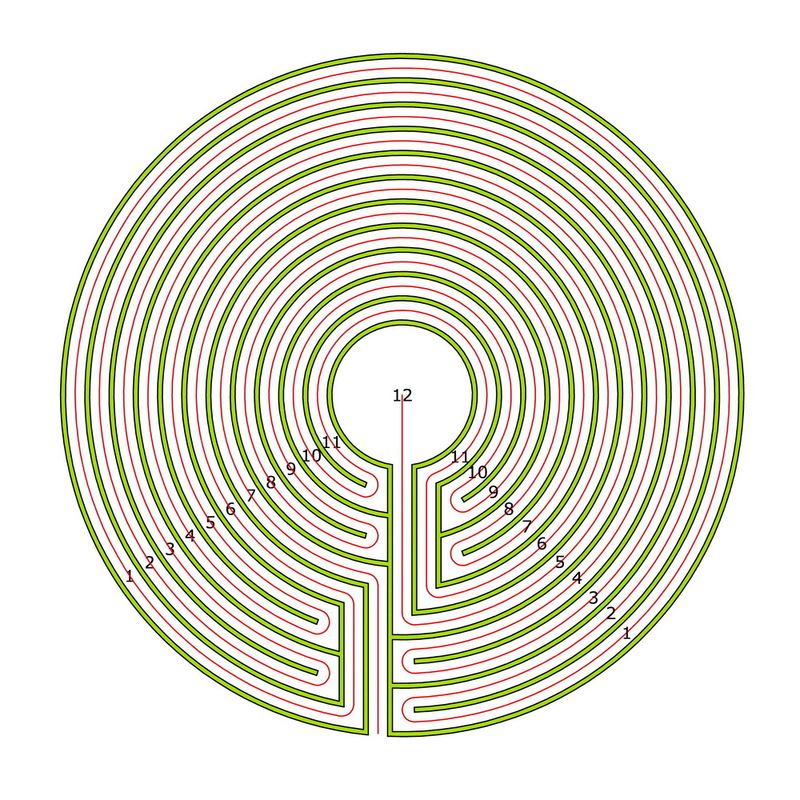 The surprising fact is that again no 11 circuit Classical labyrinth could be generated through the transformation. 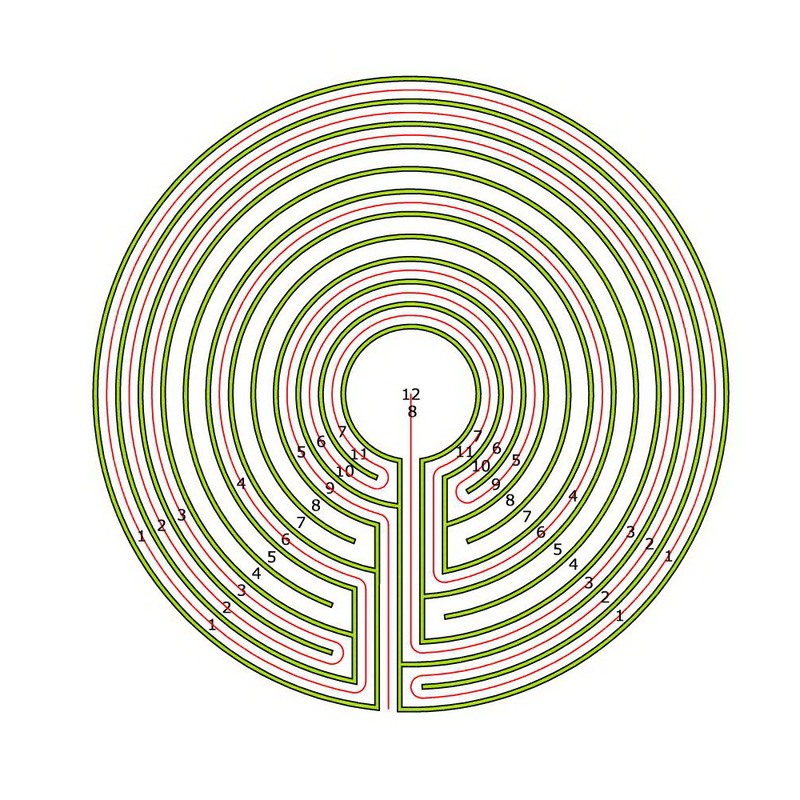 Rather two 7 circuit labyrinths. Quite simply: By leaving off the barriers in the minor axes. 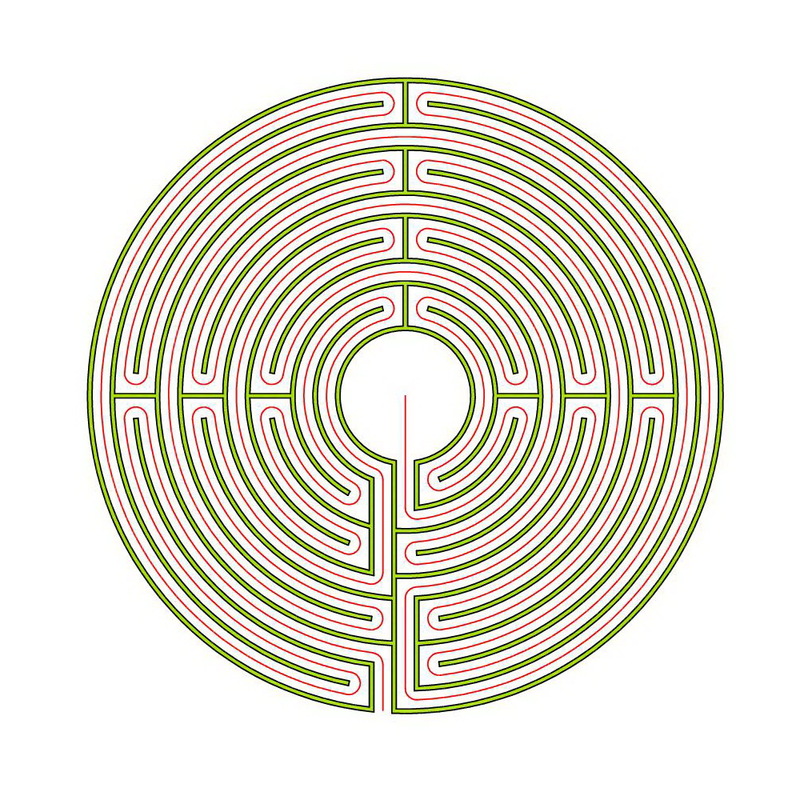 I have already tried this with the Chartres labyrinth (see related posts below). But is that also possible with every other Medieval labyrinth? As an example I have chosen the type Auxerre that Andreas showed here recently. This labyrinth is self dual as are Chartres and Reims, therefore of special quality. And they all have a complementary version. 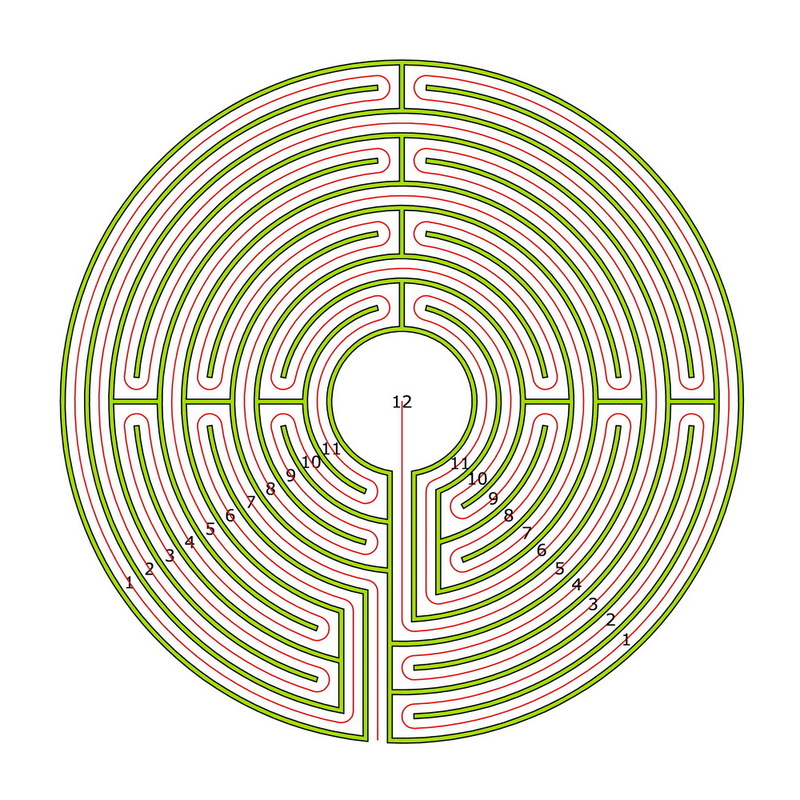 Here the original with all the lines and the path in the labyrinth, Ariadne’s thread. The barriers in the minor axes are identical with those of the Chartres type. There is only another arrangement of the turning points (the lanes 4, 5, 7, 8) in the middle of the main axis. The barriers are omitted. When drawing Ariadne’s thread, I found that four tracks could not be inserted. Hence, I have anew numbered the circuits and there remain now 7 circuits instead of the original 11. 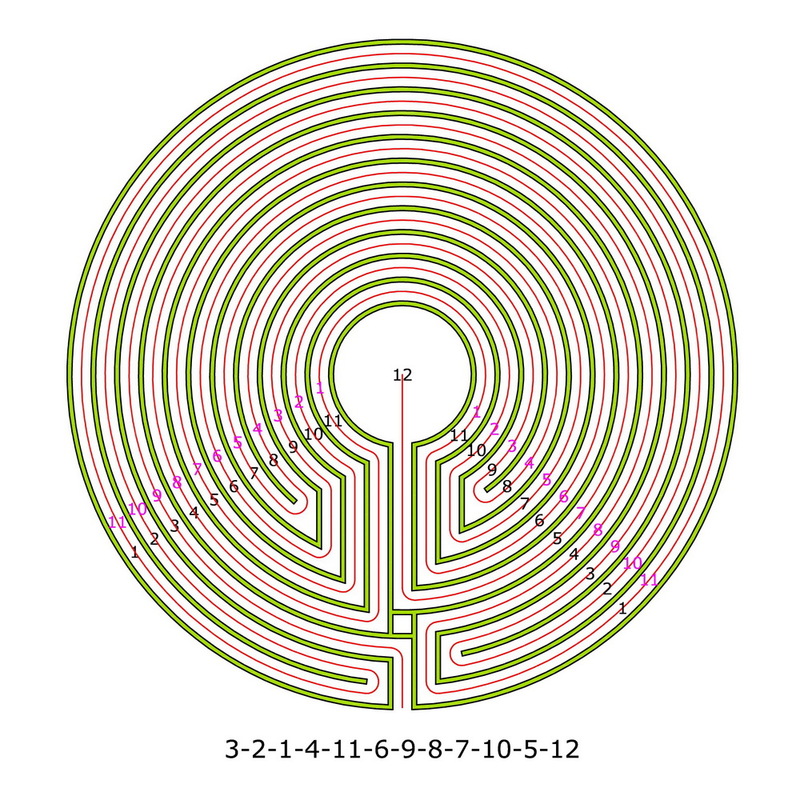 However, this also means that by changing this Medieval labyrinth into a concentric Classical labyrinth through this method no 11 circuit labyrinth is generated, but a 7 circuit. 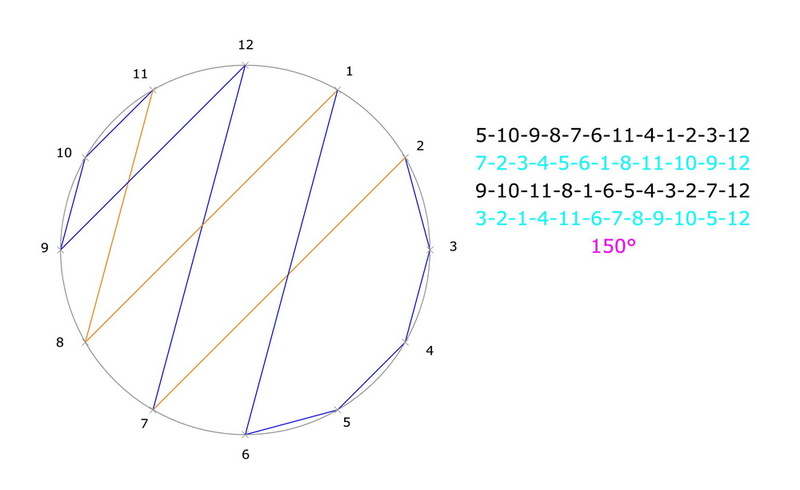 If one looks more exactly at it, one recognises the well-known path sequence: 3-2-1-4-7-6-5-8. 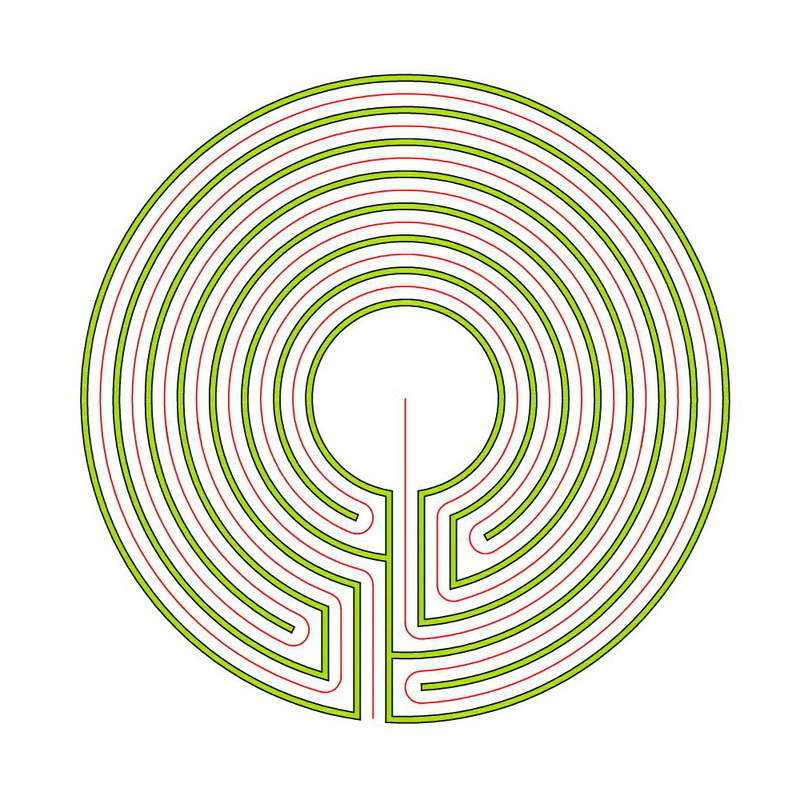 We got a Cretan labyrinth in concentric style. As with the original, four lanes can not be inserted (4, 5, 7, 8). 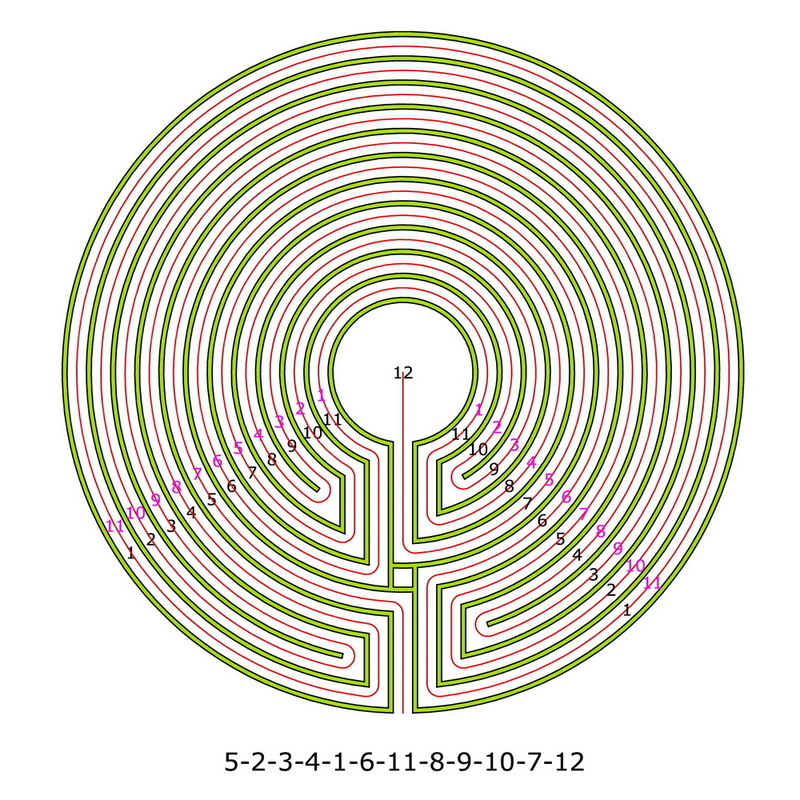 Therefore, the result is again a 7 circuit labyrinth. I renumbered the lanes and have redrawn the labyrinth. 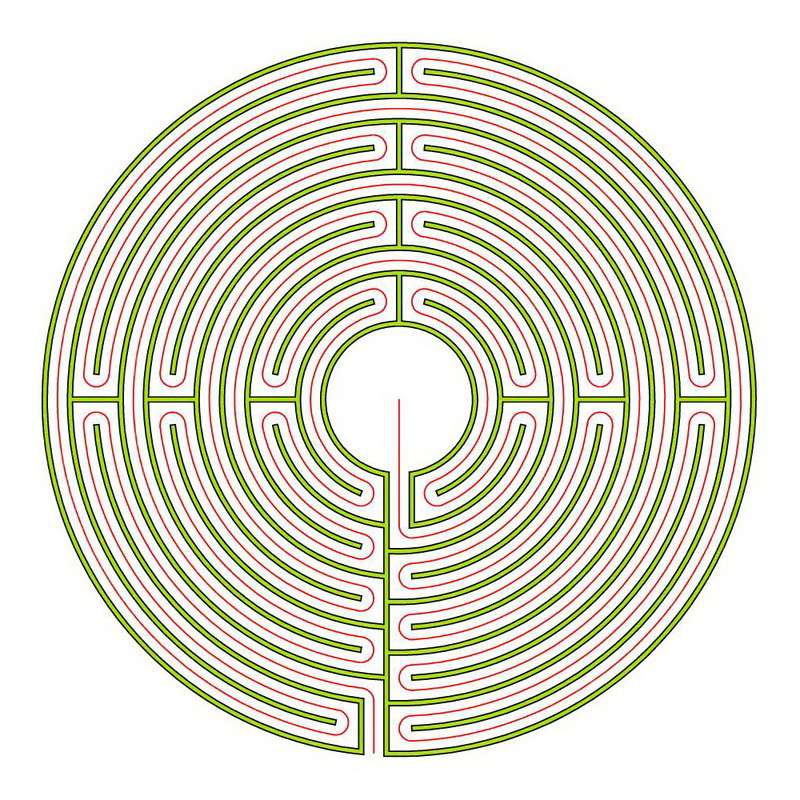 The labyrinth is entered on the 5th lane, the center is reached from the 3rd lane. The path sequence is: 5-6-7-4-1-2-3-8. This labyrinth is not one of the historically known labyrinths. But it showed up in this blog several times (see related posts below). 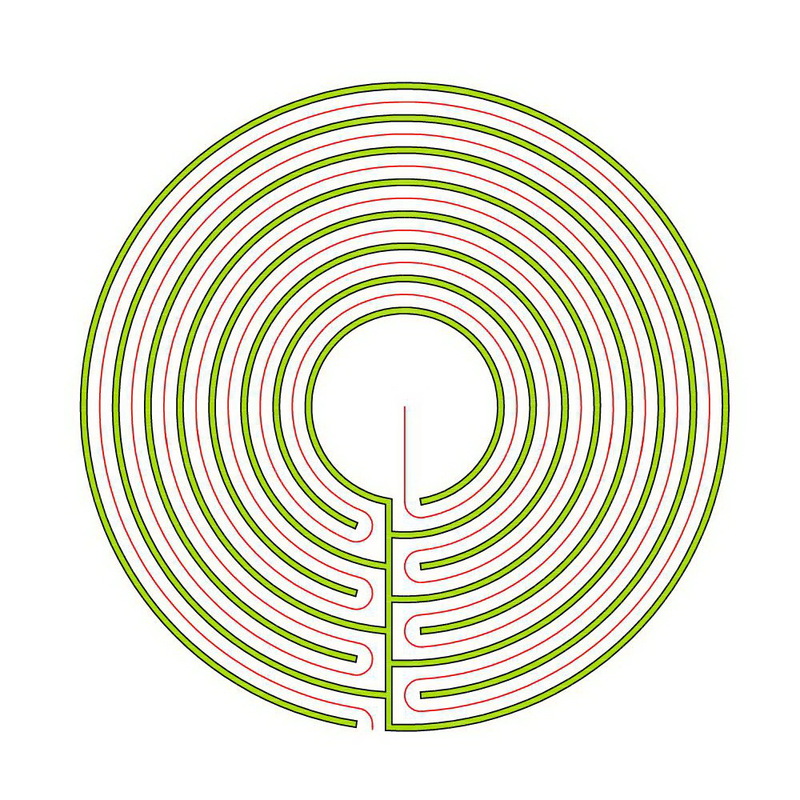 Because it belongs to the interesting labyrinths among the mathematically possible 7 circuit labyrinths. 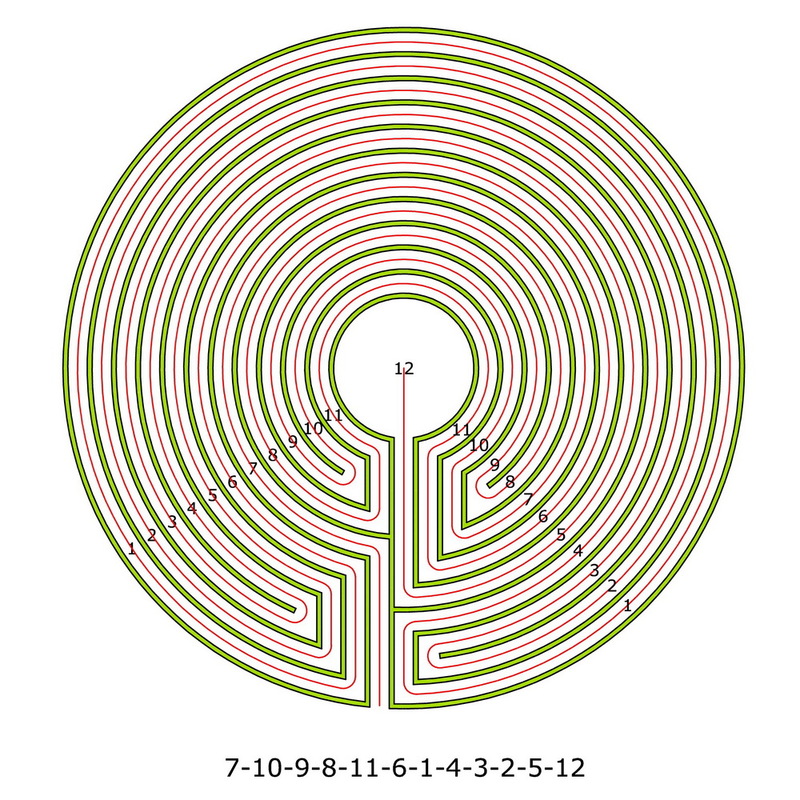 The surprising fact is that no 11 circuit Classical labyrinth could be generated through the transformation. 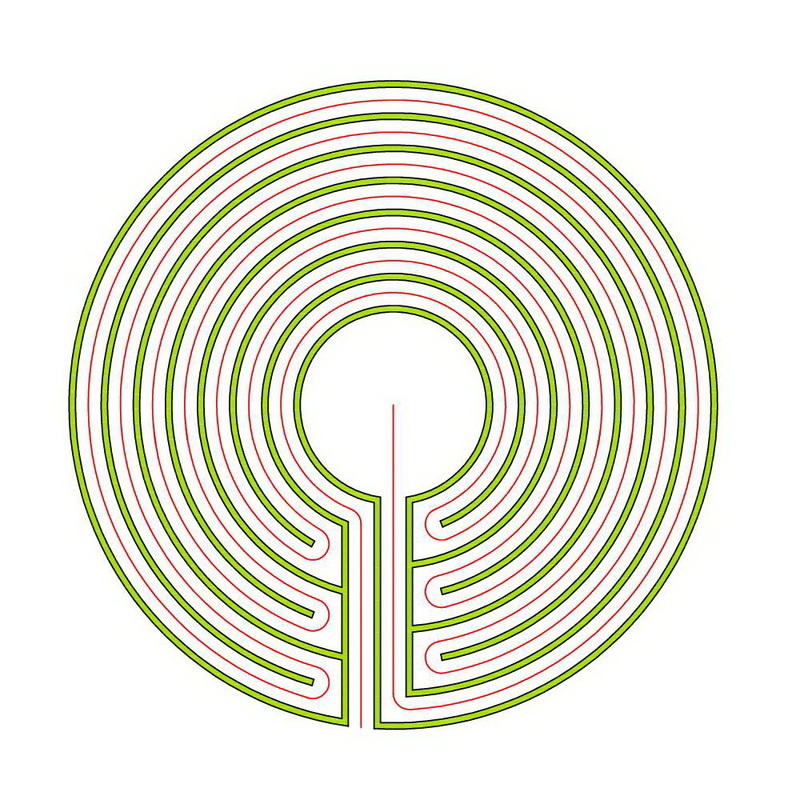 But for that the 7 circuit Cretan labyrinth. Therefore we can say that the heart of the Medieval Auxerre labyrinth is the Cretan (Minoan) labyrinth as it is in the Chartres labyrinth. 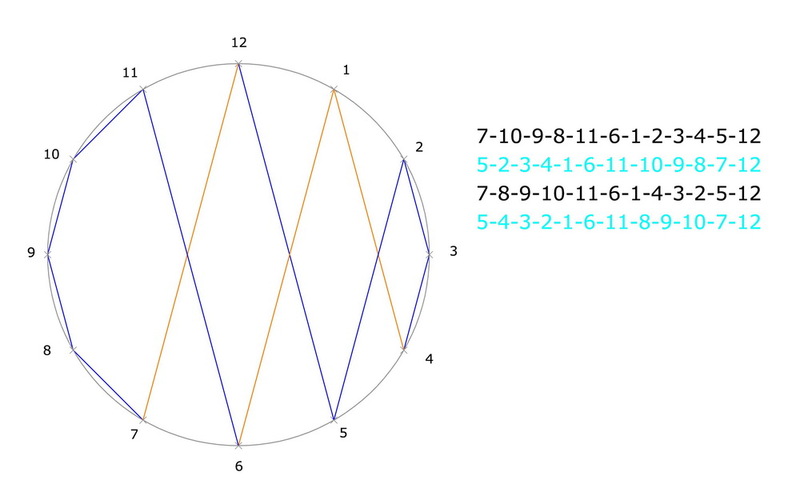 In the last post I have introduced the eleven-circuit Cakra Vyuh Labyrinth. Even though the seed pattern has a central cross and also can be easily drawn freehand, it is not a labyrinth in the Classical style. In fig. 1 I show the seed pattern in different variants. Image a shows the original seed pattern, image b the seed pattern in the Classical style, image c in the Concentric style, and image d in the Man-in-the-Maze style. This figure clearly shows that the original seed pattern deviates from the Classical style. It is true that this seed pattern has a central cross as for instance the Cretan labyrinth also. However in the Cakra Vyuh seed pattern, from this cross further junctions branch off. This is different in the Classical style. The Classical style consists of verticals, horizontals, ankles and dots. For this, no central cross is required. This page illustrates well, what I mean (left figure of each pair). If a seed pattern includes ankles these lie between the cross arms and do not branch off from them. The four images in fig. 1 in part look quite different one from each other. So how do I come to the assertion that they are four variants of the same seed pattern? Let us remember that these figures show seed patterns for the walls delimiting the pathway. Now let us inscribe the seed patterns for the Ariadne’s Thread into these figures (fig. 2). At first glance this looks even more complex. However, if we focus on the red figures, we will soon see what they have in common. 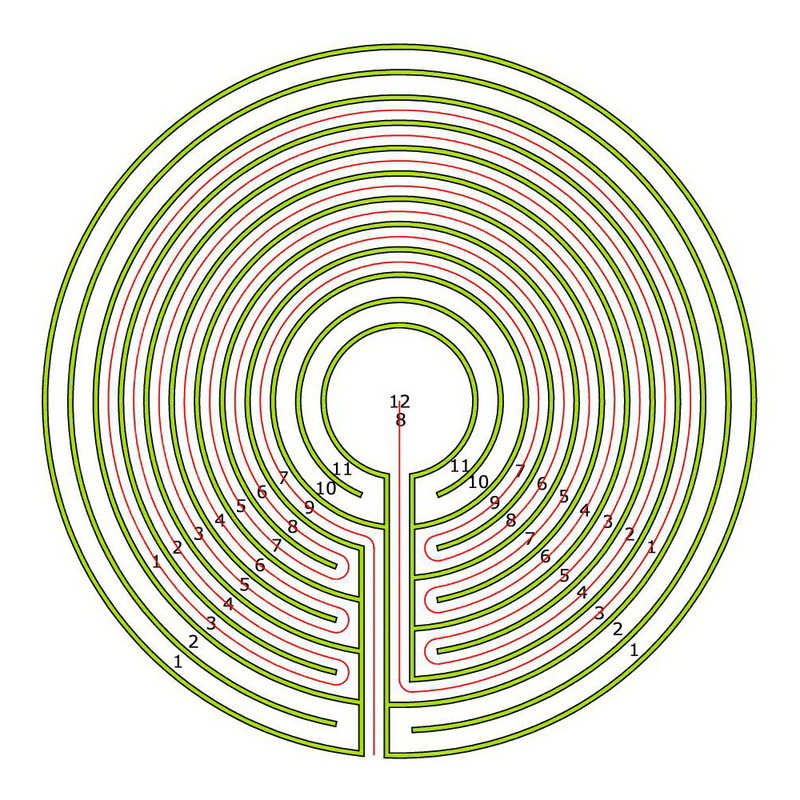 The seed pattern represents a section of the entire labyrinth. More exactly, it is the section along the axis of the labyrinth. The turning points of the pathway align to the axis. This can be better seen on the seed pattern for the Ariadne’s Thread compared with the seed pattern for the walls delimiting the pathway. In all four seed patterns, turns of the pathway with single arcs interchange with turns made-up of two nested arcs. This constitutes the manner and sequence of the turns and is the basic information contained in the seed pattern. In the four seed patterns shown, the alignment of the turns may vary from circular (image a, image d) to longisch, vertical, slim (image b, image c). The shape of the arcs is adapted to the shape of the walls delimiting the pathway. However in all images it is a single turn in alternation with two nested turns.